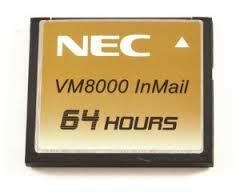 The NEC SV8100 In mail VM8000 1G compact flash card AKS InMail-APP CF with VRS/IntraMail Application (64 hours). This is needed if you have the VM8000 Inmail daughter board. Note: 32 hour version shown.